Considering how many gaming apps are published each week in a mobile gaming gold rush that shows no signs of slowing, finding one that is simply average feels almost like a win. Streetbike: Full Blast, the latest excreted onto the iTunes app store, will suffice at a buck. 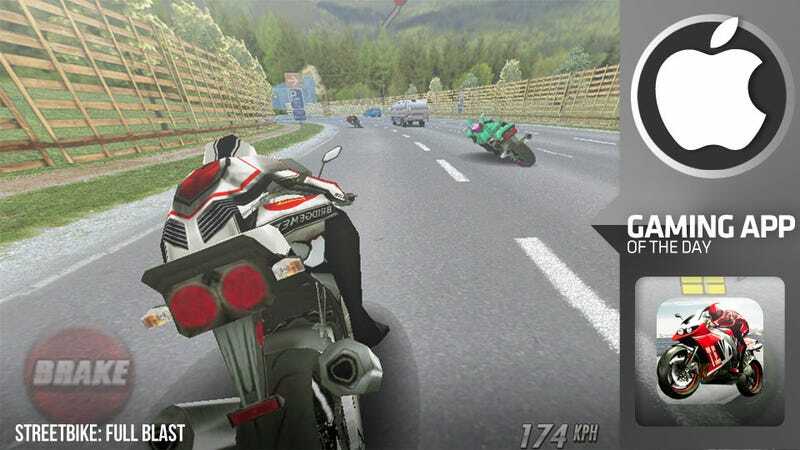 Streetbike applies all the familiar mechanics of a late 1990s console racer, from the too-clean visuals, to rubber-banding AI, to reliable-if-repetitive sound. The track layouts feature minimal elevation changes and no shortcuts, but they kick enough switchbacks and chicanes at you to require some technical braking and course familiarity—past the first lap, anyway—if you're going to win. Don't be afraid to lean like hell on the controls.It's near impossible to be thrown from your bike, so scraping the pavement with your knee is of even less concern. (I was only dismounted when, attempting a wheelie, an AI racer slammed into me from behind). Smacking into anything simply brings you to a full stop. That's unfortunate. While the heavy-traffic modes make for a lot of cheap collisions, sliding into a van and going full yard-sale into a billboard would help punch away at the just-good-enough monotony of Streetbike. There are two main modes of play, a quick play featuring eight variants (time attack, one-on-one, pass-cars, etc.) and a circuit racing mode pitting you against 11 other AI bikes. Overtaking the field is reasonably accomplished after a single lap unless you're just totally pathetic. Completing the race unlocks additional challenges. If you lack that patience, you can buy your advancement. I don't mean to suggest Streetbike isn't worth the money. What the hell, do you expect it for 49 cents? The problem is everything out there is a dollar, and while Streetbike doesn't really stand apart from the crowd with what it offers, the 99-cent class is one hell of a large crowd. For those who don't already own a racing game and or need a new one, Streetbike: Full Blast will fill in acceptably. You can call that damnation by faint praise, or you can call it praise with a faint damnation. It all averages out. So does Streetbike.